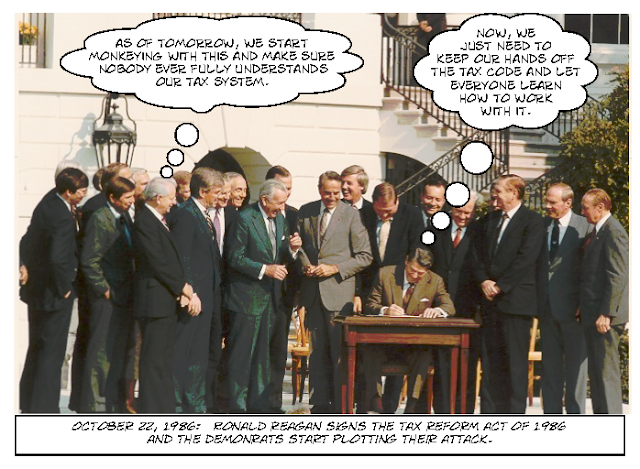 I was taking a tax update webinar this morning and the instructor, Annette Nellen, had this picture of the signing ceremony from the monumental 1986 Tax reform Act, which made several major changes to the tax code. 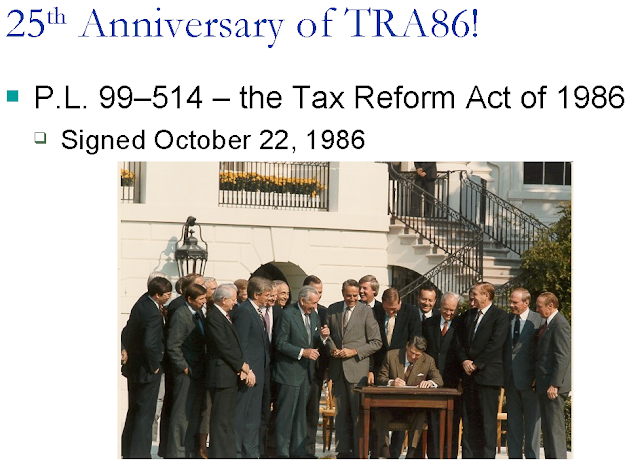 25th Anniversary of the Tax Reform Act of 1986. Is the 25th anniversary a time to celebrate it or wonder what happened to it? The Tax Reform Evidence From 1986 Experience implies that the combination of base broadening and rate reduction would raise revenue equal to about 4% of existing tax revenue. I couldn’t resist the temptation to show what was really going through their minds at that signing ceremony. Click on the image for a larger version. This entry was posted on October 25, 2011 at 2:46 PM	and is filed under TaxCuts, TaxRates, TaxReform. You can follow any responses to this entry through the RSS 2.0 feed. Both comments and pings are currently closed.